It is notable that the same week that Israel marked the twentieth anniversary of the assassination of prime minister and defense minister Yitzhak Rabin, Palestinian Authority President and PLO chief Mahmoud Abbas went before the UN Human Rights Commission and asked the UN to establish “a special regime of international protection” for the Palestinians against Israel. “It is no longer useful to waste time in negotiations just for the sake of negotiations. What is required is the ending of the occupation in accordance with international legitimacy,” said the man who has never held good faith negotiations with Israel in his life and has refused to even pretend to hold them for the past seven years. It is ironic that Abbas issued this latest salvo in his diplomatic war against Israel the week that Israel marked Rabin’s assassination. As our putative peace partner was slandering us on yet another international stage, yet again our introspection around the anniversary of the murder showed that we have learned very little over the past twenty years. As is the case every year, the Left used the anniversary of Rabin’s murder to accuse the Right of responsibility both for Rabin’s assassination and for the failure of the peace process with the PLO. For their part, nationalist commentators restated the obvious fact they repeat every year: there is a world of difference between solicitation of murder and a policy dispute. Israel’s annual national self-flagellation around the anniversary of Rabin’s murder is a twofold travesty. It is a travesty first because it prevents us from coming to terms with the true reason that Oslo has failed. And it is a travesty because it distorts to the point of non-recognition Rabin’s record as a leader and his lifelong dedication to Israel’s national security. The Left’s claim that Yigal Amir killed not only Rabin but the chance of peace rests on the assumption that unlike the five men who have served as prime minister since Rabin was killed, Rabin would have reached a final accord with Yassir Arafat if he had lived to finish his term in office. This claim ignores the nature of the Oslo process and distorts Rabin’s position on it. Contrary to what Oslo’s architects and supporters claim, the Oslo process never could have brought peace between Israel and the Palestinians. It never could have brought peace because the PLO was never interested in peace. Right after Yassir Arafat concluded the initial deal with Israel in September 1993, he flew from Washington to South Africa. There he told a Muslim audience that the peace process was a fraud. Arafat explained that the Oslo process would weaken Israel while strengthening the Palestinians. They would use this improved position to achieve their goal of Israel’s destruction through jihad. This wasn’t a one-time fall from grace on Arafat’s part. It was his consistent message to both the Muslim world writ large and to the Palestinians. After Israel embarked on what it viewed as the peace process with the PLO, the Education Ministry began changing the school curriculum. Beginning in 1994, Israeli children were taught that the PLO was a moderate force and a peace partner. On the other hand, following the formation of the Palestinian Authority in 1994, the Palestinians changed their school curriculum to indoctrinate their children to view Israelis as subhuman and to view the murder of Israelis as the highest moral calling. The suicide bombers of 2000-2005 were the products of this school curriculum. So too, while the Rabin government embraced the Israeli peace movement, the PLO hunted down and murdered Palestinians who peacefully coexisted with Israel, by among other things, helping Israel to catch terrorists and prevent terrorist attacks on its citizens. The PA glorified murderers in every possible way, down to printing baseball-type cards with terrorists rather than sports stars pictured as national heroes. The situation has only grown worse under Arafat’s successor Mahmoud Abbas. Under Abbas, Palestinians who merely engage in commerce with Israelis or buy Israeli products have been arrested and discredited by name. In other words, Oslo didn’t fail because Rabin was killed. Oslo failed – and continues to fail – because it was based on false assumptions about the Palestinians and the nature of their conflict with Israel. Aside from the faith it placed in Arafat as a peacemaker, Oslo assumed that the absence of peace owed to the absence of a Palestinian state and was therefore Israel’s fault. If Israel would just give the PLO sufficient lands to make it happy, then there would be peace. Shlomo Ben Ami, who served as foreign minister when the Oslo process ended at Camp David in July 2000 and at the start of the Palestinian terror war that followed, explained just how wrong this assumption was. The Palestinians, he said were never interested in settling their dispute with Israel on any terms. In other words, Oslo was never a peace process because the Palestinians saw it not as a means to build their own national homeland but as a means to destroy Israel. The notion that the peace process died with Rabin is absurd because the peace process never existed outside of the Left’s imagination. This brings us to the second travesty at the heart of Israel’s annual self-hate fest. Not only does it distort the nature of the Oslo process, it distorts Rabin’s life and legacy. Rabin was not a peacenik. He was not a starry eyed ideologue. Rabin was a security hawk who dedicated his life to Israel’s defense and security. True, Rabin believed that the absence of peace with the Palestinians was the root of the larger Arab world’s rejection of Israel. But he also believed that there was a limit to what Israel could offer the Palestinians. Rabin foresaw the outlines of a final deal with the Palestinians as laying more or less along the lines set out by Yigal Allon in his peace plan in 1967. Rabin believed that the endstate of the peace process would involve an autonomous Palestinian governing authority rather than a state presiding over around half of Judea and Samaria and a large part of Gaza. Jerusalem, in his view, would remain united under sole Israeli sovereignty. The Israeli communities in Judea, Samaria and Gaza would remain in place. Israel would maintain its control over the areas not ceded to the Palestinians, including the international borders with Egypt and Jordan in perpetuity. Not to put too fine a point on it, but Rabin’s vision of a final deal looked much more like to the Jewish Home Party’s diplomatic plan than the Labor Party’s position. Rabin was also not enamored with Arafat or the PLO. Rabin was not the architect of the Oslo process. Shimon Peres and his associates negotiated the initial deal at Oslo behind Rabin’s back. 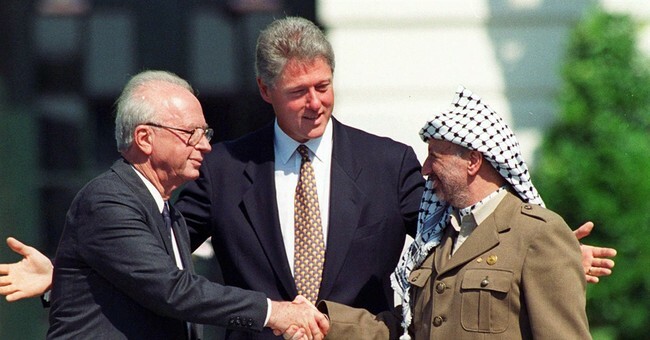 Rabin felt compelled to adopt their deal after the fact because he had promised voters in the 1992 elections that he would pursue peace with the Palestinians. Once Peres and his associates pressed ahead with the PLO in Oslo, the peace process Rabin oversaw (and knew about) in Washington had no chance of succeeding. He would have broken faith with his constituents if he had rejected Peres’s Oslo accord. But even as he adopted it, he maintained a healthy skepticism of its chances of success. And as the terror attacks mounted in the months that followed the signing ceremony on the White House lawn, Rabin began considering cancelling the process. By the eve of his murder, due to mounting Palestinian terrorism, Rabin was seriously considering abrogating the Oslo process entirely. In an interview on the 15th anniversary of her father’s murder, Dalia Rabin explained that her father was on the verge of cancelling the deal and turning back the clock. Abbas’s actions at the UN this week, where he called for the world to protect the Palestinians from Israel while back at home he simultaneously continued his calls for Palestinians to take up knives and take to the wheel of their cars to murder Israelis cannot come as a surprise. They are of a piece with the PLO’s previous diplomatic machinations from 2000 to 2003 in the wake of its terror war against Israel. Those machinations led the US to form the so-called Quartet with the UN, Russia and the EU and embrace the Roadmap for Peace, the most anti-Israel diplomatic document to have ever seen the light of day in 2003. Today Abbas uses terror at home to convince the UN to dictate the terms of Israeli surrender in Judea, Samaria and Jerusalem to the PLO. Abbas and Arafat succeeded 12 years ago and may succeed today for a number of reasons beyond Israel’s control, but also for one reason that Israel does control. Abbas is able to succeed at the UN in part because Israel refuses to acknowledge that there never was a peace process. Arafat lied to us, and to the world about his intentions and we lied to ourselves about the nature of the Palestinian war against us. So long as we continue to play along with this tired charade, we will be unable to conceive and implement a diplomatic defense that is coherent and effective against the mountains of lies and murder on which the PLO has based its war against Israel for the past 55 years. Israel contributes to the PLO’s diplomatic success at the UN because it refuses to do what Rabin recognized was necessary 20 years ago. Rather than learn from his record, Israel has spent the past twenty years distorting his record. The time has come to do justice to Rabin and end the Oslo process once and for all.